A Philly doctor’s patients have been following the Fit-Step® Diet for over a decade with successful and permanent weight loss and fitness. The method is easy to follow, affordable and sustainable: a realistic option for all who seek to improve their health and fitness. Fred A. Stutman, M.D., known as Dr. Walk®, presents a walking and strength training program and a variety of suggestions for healthy meal and snack choices. Dr. Stutman blends science – nutritional data and medical study results – with simple things that enable readers of all ages and all sizes to succeed. With a tip of the cap to his hometown, Philly’s Fit-Step® Walking Diet references famous landmarks and walking tours in the City of Brotherly Love. Yes, with some planning and proper portion size you can indulge in some of our world-renowned favorites like the cheesesteak! No matter their locale, readers are encouraged to explore what their region offers by way of walking tours and trails and use the book’s tips to alter local fare into something that can be enjoyed healthily. Readers can lose 15 lbs., start shaping up and looking younger in as soon as 21 days and sustain that progress! Permanent results… Now that’s something readers can live with! "Dr. Stutman's book is exceptional in many regards. It describes medical and physiological concepts in a manner that is easy for the layperson to understand, yet it also offers in-depth information not only on what to do, but why to do it." 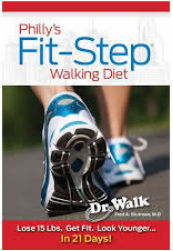 Philly’s Fit-Step® Walking Diet was selected from among dozens of entries for feature on the cover of a recent issue of the prestigious Independent Book Publishers Association's Publishers Weekly.